Does anyone have photos of their rear control arms after trimming the leading edge for wheel clearance? Sorry Mate, I don't have photos but I can describe what I did to avoid using rear spacers. 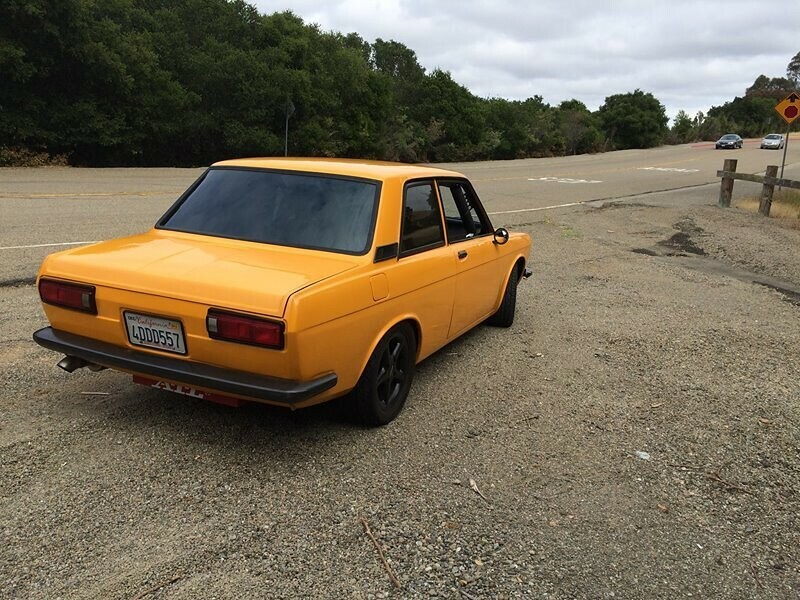 When I bought Enkei wheels for my 510, I knew the offset would be right on the edge of needing a spacer. I bolted the rim on the hub before I mounted the tires and as feared they bound on the trailing arm. I could see it was close so instead of using a spacer, I marked by scratching the paint exactly where the inner edge of the rim made contact with the leading lip of the arm. I removed the wheel and used a cutoff wheel to grind just a bit of the lip off. I installed the wheel again and repeated the process until the it had about an 1/8" 3mm space between the rim and lip (for wheel flex). All together I took about a 14mm wide X 10mm deep notch out of the lip. I've seen people take much more than that, where it actually cuts into the razed part of the arm a bit, but they welded a filler plate of steel to to cover the hole and maintain the integrity. Im running 14 x 6.5 +25 wheels on the rear. BR Specials. A Watanabe look a like. What you described is what I was thinking of doing. In my case, a bees d**k is all I need to shave off the edge of the trailing arm to achieve the correct clearance. One poorly positioned wheel weight is the only thing preventing the rim from turning freely. I did specifically ask the wheel shop to put ALL weights inboard. I run 15x7 +25 AND HAVE NO PROPLEM..REARS I have 195/45 tire but 195/50 should be fine also. IN front is close with stuck 510 struts. I have the same dimension rims as Bonzai, but had rubbing because not all rims are designed alike. Yeah, not surprising you had issues on a 14" rim with +25mm offset. Rubbing is usually worse the smaller the rim, but yours are 6.5" wide so that narrows the inner edge by 6.35mm. 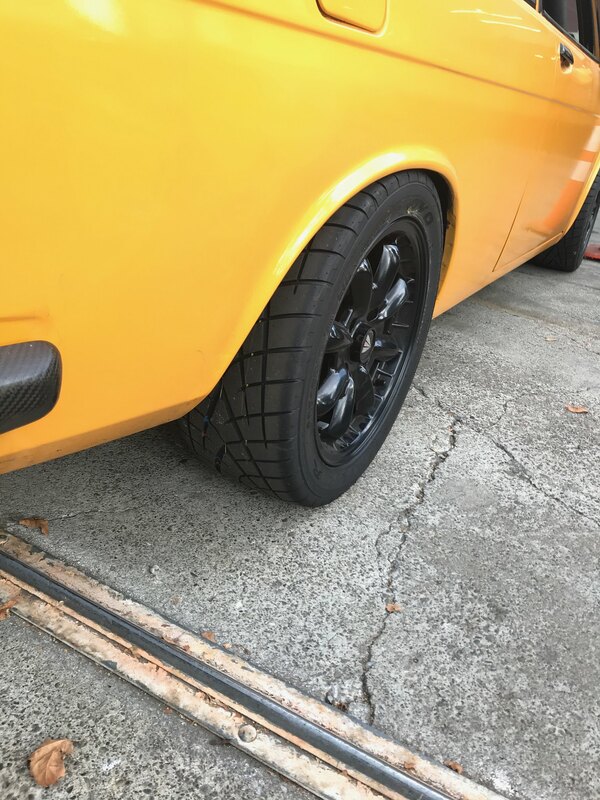 I have 205/40s on the rear, but by the time the arm extends past the inner lip of the rime, it angles out enough so on a 7" rim there's plenty of room for an 8" wide tire. In my case I have a good 5/8" (15.875mm) space between the arm and wall of the tire. I had to roll the lip, pound out the inner shoulder, and perform a bit of crowbar flaring of the fender to get them in there, but I got it all tucked under the car nice and neat. Good luck on yours, and send photos!